This special anniversary collection of has a double-dose of inspiration - personal stories of how Chicken Soup for the Soul changed lives, and the life-changing story itself! 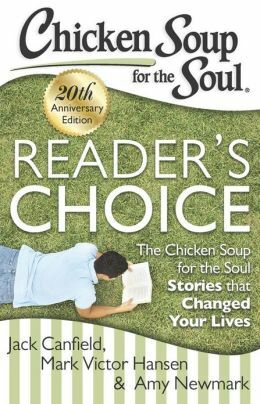 Twenty years later, Chicken Soup for the Soul and its stories are still changing lives! This special twentieth anniversary collection celebrates the power of storytelling. Readers share their personal, inspiriting stories about how a Chicken Soup for the Soul story made a difference in their lives, paired with the life-changing story itself. It’s a double dose of inspiration! Reading through this book brought many smiles and tears. As many of the stories were familiar to me and I loved reading how the stories in the book changed their lives. One story that stands out for me is I Am Me and I Am Okay. It was a story about how a reader had to self esteem after her divorce and she struggled every day with that and other problems. One day she picked up a copy of Chicken Soup for the Soul and started reading it and soon she was enjoying life again. It was great to see how a few stories can help so many people. I am sure that you would enjoy this book too~as no matter what your age is Chicken Soup books are so refreshing. My favourite book is Food and Love and definitely, I can't believe did that. I like your blog, it is easy to navigate. My favourite book is Chicken Soup for the Soul 20th Anniversary Edition. Thank you for the opportunity to win. I liked the Angels Among Us book. Entered the Growing Up Online Free eBook & The Lorax Blu-ray Giveaway.